Yet another mild day and things being slow at work conspired in allowing me to get one more paddle in before year's end. I have no clue as to why someone went through the trouble of tying them together before placing them in the river. Once untied they found spots onboard my boat until I returned to the launch and trans loaded them into my car's trunk. It was a huge pile consisting of many hundreds of flattened plastic bottles. They notified the proper authorities and put the word out on social media. Last I heard a woman, having heard about the problem, began work on removing some of the containers. Certainly makes one wonder what the motivation for such an act could have been. With my boat now empty I re-launched and followed the river as it swept around Orchard Hill (opening photo). While paddling back up to the Cox Street takeout I enjoyed listening to Willie Nelson's The Wall. It's my favorite song of 2014. Combined they were comprised of 65 recyclable containers (9 redeemable) and 62 pieces of miscellaneous rubbish such as nip bottles, plastic bags, and Styrofoam. My total for 2014 is 6067....Now to work on my Year End Report. 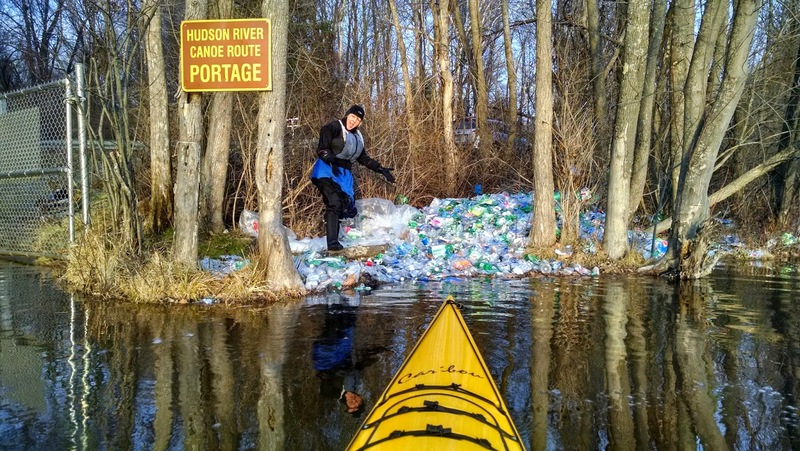 I saw the article in our local Post-Star this week, about volunteers cleaning out that large pile of plastic bottles on the Hudson here in Glens Falls.... makes you wonder, is some local business saying they DO recycle, and then NOT doing so...? Thanks Cap'n for reporting it!